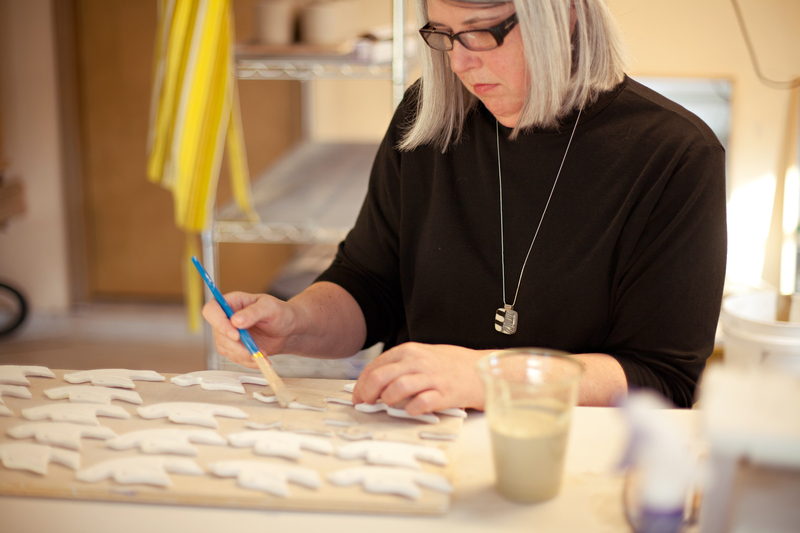 Ann Lindell is an artist/maker based in Gainesville, FL, where she maintains a home studio primarily devoted to ceramics. She holds a BA in Art and an MFA in Ceramics and Printmaking. When she’s not in the studio, she directs the Architecture & Fine Arts Library at the University of Florida. As a maker of ceramic tableware and jewelry, I am interested in both functionality and sensual appeal: what makes a person choose a handmade object for everyday ritual, or as a personal adornment? I am attracted to botanical forms, calligraphic marks, textile design, visual repetition, and patterns of all kinds. I create simple functional forms embellished with colorful, layered surfaces that incorporate motifs inspired by this eclectic source material. My aim is to contribute joy and beauty to both everyday and celebratory occasions.